I was asked, I think that it would be of a great interest that you (as a world wide reference in education) can write a very brief review (between 200-300 words) about your vision regarding ePortfolios. e-Portfolios have been around for a number of years now and we're beginning to see how they may be applied in learning and development. An e-portfolio is a collection of digital materials uploaded by a student to an e-portfolio repository; the repository owners can then make this material available publicly to prospective employers or clients, as requested by the student. A good example of such a system is the Desire2Learn ePortfolio system. http://www.desire2learn.com/products/eportfolio/ A good ePortfolio system will not only allow storage and sharing, but also interact with social networks and support comments and annotations. 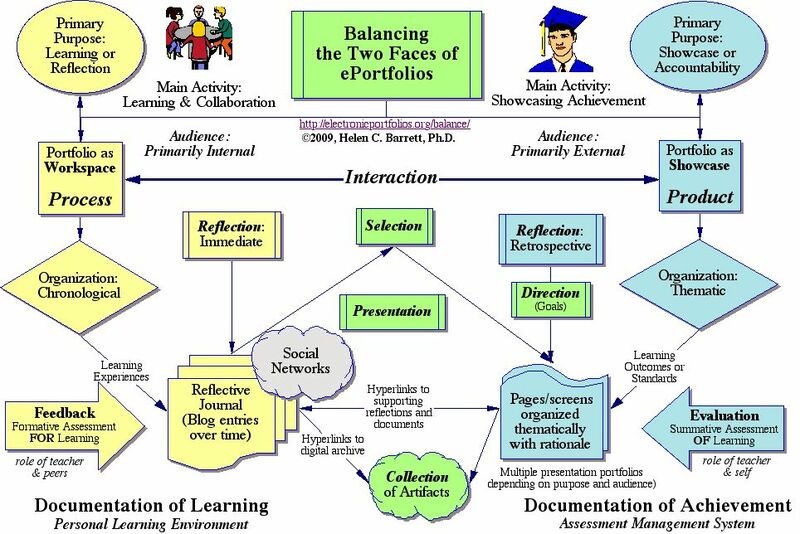 As Helen Barrett illustrates (see above) on her e-portfolio website http://electronicportfolios.org/balance/index.html the role of ePortfolios has developed in two major directions over the years. On the one hand, the portfolio may focus predominately on learning and reflection. Such a portfolio may come to resemble a student's journal or sketchbook. On the other hand, the portfolio may be used primarily for evaluation and assessment, becoming more a documentation of achievement that a personal workspace. As Barrett notes, the former model focuses on the ePortfolio as process, while the latter contemplates the ePortfolio as product. In recent years discussion of ePortfolios has been eclipsed by the excitement around massive open online courses (MOOCs). I think this is a mistake. It is important to encourage students to create and share their own work. That said, the focus on taking many courses from multiple providers makes it difficult to reply on a single provider's ePortfolio service. Increasingly, students will have to manage the hosting of their online portfolios on their own. In the MOOCs we have offered over the years, such as Connectivism and Connective Knowledge (CCK08), we approached this issue by encouraging students to use their own blogs or websites. In this case, the primary function of the central course management system was not to create and store student ePortfolios, but to aggregate from them and to facilitate the sharing of their contents with other students. In this light, a worthwhile project developed at University of Mary Washington called "a domain of one's own" is probably the modern version of ePortfolios. http://umwdomains.com/ It incourages students to establish their own web presence independently of service providers. Increasingly in the future students will be responsible for managing their own online learning records and creative products. Though they may use a variety of services - such as Blogger, Flickr, YouTube, Google Docs, and more - to store their work, they will need to manage these resources, index them, and enable access to them. This will enable them to balance between the process-oriented and product-oriented aspect of their work. This will become important as employers will over time rely less on tests and formal assessments, and will instead look for tangible evidence of personal achievement in web-based repositories. Maintaining an ePortfolio will become tomorrow's equivalent of achieving certification and polishing up one's resumé. The true value of doing e-portfolios is when both process and product involve external audiences. Since portfolios are typically “living” documents, the reflective piece is collectively retrospective, current (reflection-in-action), and prognostic since one’s work is seldom ever completed. The openness of doing e-portfolios then allows more formative assessments to emerge that contribute to greater learning potential. Summative assessments might be conducted on individual artifacts, but only after the author has hopefully had a good dose of formative assessment first. Discerning summative assessments are only possible if it complements and subsequent to large doses of formative assessment. Best to have feedback loops that are frequent, iterative, and reciprocal throughout.